A day tour to Toledo from Madrid. Discover its architecture and history with your experienced guide and enjoy free time. Enjoy a comprehensive visit to the magical city of Toledo – the UNESCO-world heritage site where famous for narrow medieval streets, beautiful architecture and rich history – mixing diverse Christian, Jewish and Muslim backgrounds. 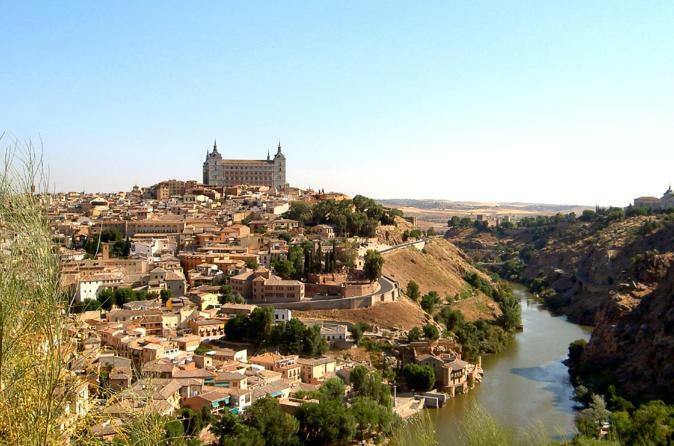 Known as the Imperial City for having been the seat of the court of King Charles I and associated with the life and works of Miguel de Cervantes, Toledo is a city with history and surprises behind every corner. Embarking in comfort from central Madrid and enjoy the panoramic view of Toledo. Discover the architecture and history of this city. Explore the Jewish Quarter, every essential monument and its buildings. Alternately, if you want to sat back and enjoy a beer or some lunch on a beautiful terrace, you will also have time to do.